Is your company facing a famine with sales? Avoid this famine syndrome by handing out plenty of customized food keychains during the next tradeshow or marketing occasion.We are hereby offering a menu which satiates your marketing needs and triggers customer interest in your business. The competition is getting bittersome and you’ll need to spice up with these personalized food keychains. You can choose the one that aptly represents your brand or business. 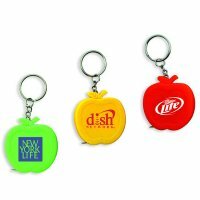 You can promote your food and hospitality business with these spicy promotional food key fobs. Regardless of what custom food keychains you order, stay assured that they'll lead you to tasty success in the niche.